Sharks have existed for roughly 450 million years-even before the dinosaurs. But, the very adaptations that have allowed sharks to survive for so many millions of years may now be working against them in the face of a relatively new threat: fishing. Under modern fishing pressure, are certain sharks "evolved for extinction?" Earlier this summer, four researchers published a paper in BioScience investigating this very question using hammerhead sharks as a case study. Hammerheads are an identifiable and intriguing family of sharks; these swift predators have a suite of adaptations designed to help them survive, and yet their numbers are declining dramatically due to overfishing. To protect hammerheads from overexploitation and extinction, the study urges fishery managers to consider these specialized adaptions in management and conservation plans. Thinking about hammerhead shark conservation in light of this family's evolutionary history is especially relevant given the recent news from the National Marine Fisheries Service (NMFS), which in June announced that four populations of scalloped hammerheads would receive various degrees of protection under the Endangered Species Act (ESA). This makes scalloped hammerheads the first sharks to be granted protection under one of the world's strongest laws protecting imperiled plants and animals, but NMFS stopped short of extending these protections to the populations living in U.S. waters. As the future of hammerhead shark conservation continues to evolve, it is especially important to understand the unique specializations that have contributed to their decline in the first place and how that knowledge can be applied to new conservation strategies. For example, certain hammerhead species have evolved traits like higher social intelligence and long-distance migrations as a result of their relatively large brain size. But developing a large brain costs time and energy, and females usually give birth to a small number of highly-developed offspring-just like mammals. Hammerheads used to be able to afford this extra development due to their lack of natural predators, but today these traits have made these sharks susceptible even to low levels of fishing. Some hammerhead species also have interesting behavioral adaptations. For example, smooth hammerheads form highly organized and complex schools (one of the only large-bodied sharks to do so), presumably to facilitate mating. However, large groups of sharks in predictable locations make for easy targets. Even if vulnerable species like the great hammerhead are released after being caught, prolonged changes in their blood chemistry-which under normal conditions may be part what makes hammerheads quick, agile predators-can result in high death rates after they are released. 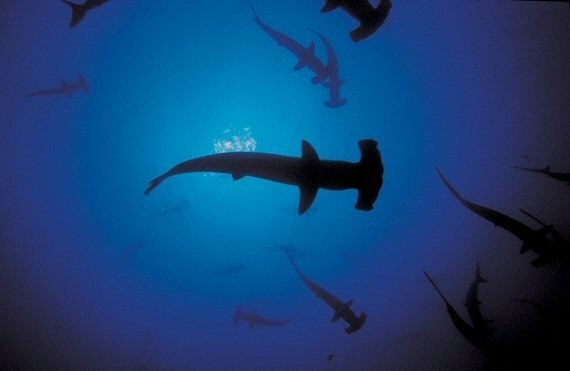 The idea that highly specialized species may be predisposed to extinction is not a new concept, according to the authors of the study; what is unique about this project, however, is a discussion of how knowledge of specific adaptations can lead to better management strategies to help conserve animals like hammerhead sharks. For instance, recent research shows that hammerheads have highly specialized senses that allow them to detect electric fields over longer distances than other sharks; people have capitalized on this adaptation for conservation by designing special electricity-emitting hooks that have been shown to deter scalloped hammerheads and significantly reduce bycatch. Moving forward, species-specific research like this will become increasingly important, especially for sharks. What makes hammerheads special may make them vulnerable, but that doesn't have to spell doom. Just as sharks have adapted, management can adapt by incorporating biological knowledge to increase conservation success for some of the ocean's top predators.